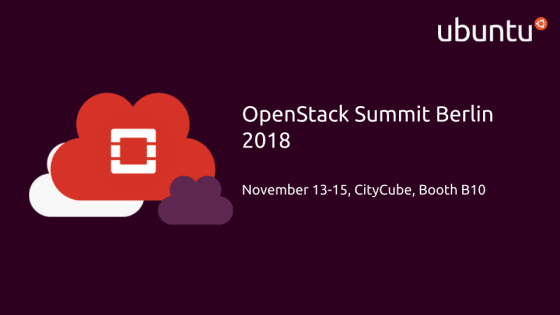 Canonical, the company behind Ubuntu, is excited to reveal that it will be a headline sponsor at the OpenStack Summit in Berlin. The OpenStack Summit has proven itself to be the leading event in open infrastructure, bringing together the builders and operators for sessions and workshops on containers, CI/CD, telecom & NFV, public cloud, multi-cloud and much more. Ubuntu is at the heart of the world’s largest OpenStack clouds, in key sectors such as finance, media, retail and telecoms. With Ubuntu the number one platform for OpenStack and public clouds, Canonical is a leader in building and operating multi-clouds. If you’re coming to Berlin for the OpenStack Summit, we’d love you to come and visit us at Booth B10, where you can talk to Ubuntu experts about everything from OpenStack to Kubernetes, artificial intelligence and machine learning, multi-cloud and much more. In addition to a large booth presence, where the team will be more than happy to answer any of your queries, the Ubuntu team at Canonical will also be giving a number of presentations, whilst Mark Shuttleworth, CEO and Founder of Canonical, will be delivering the opening keynote. Service provider Cloud Edge: ‘Edge cloud’, the generic term used by the industry to describes a wide array of infrastructure deployment sizes for use-cases from Radio Base station ‘pods’ to larger Central Office locations, generally describes highly distributed compute pools which can be utilized for a number of applications in modern Telco use-cases like 5G, AI/ML and Video processing/caching workloads close to the customer. Canonicals’ Service Provider Edge demo show-cases a modular approach to the use and re-use of very powerful opensource technology primitives, machine automation and advanced modelling to meet the ever evolving use-case demand on the edge infrastructure, without the need to for the Service Provider to change tooling or process each time. Enterprise private cloud: Migrate or build your infrastructure with OpenStack, Kubernetes, encryption at rest and backup & restore for a secure or compliant private cloud. Find out how you can get a managed cloud service delivered in 3 weeks for a cost effective, fast out of the starting block deployment option. Multi-cloud: Running a Kubernetes infrastructure across multi-cloud with the Canonical Distribution of Kubernetes. AI / ML: Setting up development processes and infrastructure for cloud native machine learning.